For the first time in my life, I took a trip to Florida last month to attend the Children’s Miracle Network Hospitals conference. Held at the Disney Coronado Springs Resort in Orlando, it was a week filled with surprises. 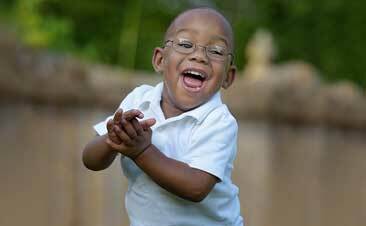 I was surprised to meet a child with progeria, as this condition is extremely rare. A CMN Hospitals 2018 Champion, Carly Kudzia is just one of 17 children in the U.S. living with this condition that causes her to age rapidly. Carly was a joy. I was surprised for the opportunity to have a conversation with John Schneider, co-founder of CMN Hospitals. John was only 22 years old and at the height of his Dukes of Hazzard fame when he became involved with CMN Hospitals, and I was impressed he is STILL involved. I admire his tenacity. His theater background and recent Dancing with the Stars gig prepared him well to open the awards ceremony with a dynamic performance from the recent hit movie The Greatest Showman. He performed with the CMN Hospitals champions, all of whom had energy on tap, delighted the audience and revved up a room full of fundraisers. I was surprised to learn that Walmart has raised $1 billion for CMN Hospitals. This represents the largest amount ever raised for a nonprofit by one company in North America! All those donations at the register add up to a lot of money and have a tremendous impact on kids’ lives. I did not realize that our Canadian friends were part of the CMN Hospitals network. Twelve children’s hospitals from Canada were represented, and could often be seen at the conference sporting red maple leaf-emblazoned pants. They were proud to be there. I was surprised to learn that the 2018 CMN Hospitals National Champion, our own Marlee Davenport from Ellettsville, Ind., will be featured in an upcoming reality TV show. “Real Moms” follows a few CMN Hospitals families and chronicles how their life is impacted by having a child with a serious medical condition. (Carly is in it too!) It will debut on Mother’s Day, and we’ll keep you posted as to where you can catch it. Anne Smith, Purdue Dance Marathon Vice President of External Affairs attended the conference and had a chance to talk to John Schneider too. She told him, “I’m sure you’ve heard about Tyler Trent.” John had not. That really surprised me. In Indiana, Tyler was in our hearts and minds for the better part of 2018. Yet the founder of CMN Hospitals had no awareness of Tyler’s journey. He congratulated Anne for helping to raise $1.2 million, but it just goes to show we need to keep our message of supporting children’s hospitals front, center and constant. 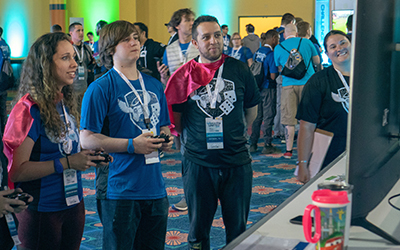 The conference included Extra Life United, a gathering of fundraisers who raise money through board and video gaming. There I met Jo and Victor Enmon. Their daughter Victoria passed away in 2008 and was the inspiration for Extra Life. 10 years later, Extra Life has raised a whopping $51 million. Victoria had acute lymphoblastic leukemia, the same type of cancer as Riley kid and 2019 Indiana CMN Hospitals Champion Cooper Davis had. Now 14 years old and healthy, Cooper participated in Extra Life United and raised $1,200 on his Extra Life page. What surprised me? When diagnosed, Victoria’s doctors said she had a 95% chance of survival. Her place in that tragic 5% statistic turned a family’s darkest moments into millions of dollars of donations. Watching Jo Enmon and Sandy Davis, Cooper’s mom, meet for the first time was incredible, but not a surprise. Moms connect, especially moms who have traveled down the same road of a pediatric cancer diagnosis for their child. These two women now have a bond they wouldn’t have sought out, but they are doing a world of good raising money for other families walking in their shoes. Last surprise: The incredible commitment of the Extra Life gaming community. I had an opportunity to interview a few players, and the support, sportsmanship and genuine caring for each other was heartwarming. They all agreed: If you’re going to game, you may as well be raising money. In a day and age where schools are making ‘e-sports’ a varsity sport and job recruiters are looking at accomplishments of gamers, they’re also influencing donors. Before Extra Life, they were an under-asked community. Things have changed, and they are incredibly proud of the impact they’re making. 62 children enter a CMN hospital every minute. Some of those kids walk through the doors of Riley Hospital for Children. Thank you for being there for them. Click here to learn how you can become a CMN partner and raise money for Riley Hospital for Children. Laura Buckner is Senior Communications Officer for Riley Children’s Foundation and has served in that role for nearly four years. Her background is in communications, public relations and marketing. She previously served as Marketing Director for the Indianapolis Children’s Choir and is a four time regional Emmy award winner. She has three grown children, two of whom are former Riley kids.